So many mistakes made, no way to fix them. I love your videos! I really enjoy the Avatar Hell videos, and I also like the Baby One More Time. I would say that some of the effects you used on Zuko's Lullaby don't really seem to fit the song, but otherwise, very cool! 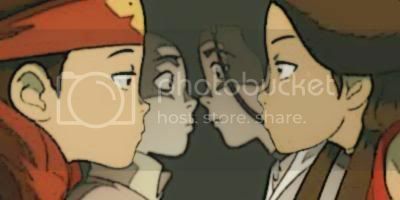 Keeper Of: Zuko's Hideous Parted Hair, Katara Touching Zuko's Scar, and Ty Luko. ^ Nice one. I really liked the interpretation of the lyrics. Well done. AHAHAHA I haven't been here in a while, yeah? Well, I've put some of my old stuff on my new Youtube (that I could salvage) as LiveVideo only works about 50% of the time, and even then the site itself will load but videos won't. Oh well. ........which youtube apparently deleted? ? what. all my other videos still exist! Mods - feel free to combine this with my previous ATLA/LOK AMV master post thread. I tried to find it to post this there but the search function isn't working. Because of how much Youtube keeps changing I've been archiving my ATLA & LOK AMVs (and other fandom videos) on a new platform that's more lenient and considers the content Fair Use because it's transformative. This is where I'll also be uploading any new AMVs I make in the future. I got a few of my Slash ship videos on there and I'm working on uploading more including my Gen videos and Het shipping ones as I find them going through old accounts and old external hard drives. But yep - I've changed over where you can see my AMVs! As I know back when I was actively making them they were pretty well received on this forum! Hope you enjoy! And if you're an avid AMV maker like myself I recommend you give this site a try! Their HD player is really nice, even when I use it on my IPhone to watch stuff. And it doesn't buffer as much as other sites do. Plus this site secures the video content where people can't rip it and repost it elsewhere (common issue with Youtube and others). I just started uploading a couple months ago and my AMVs/fanvids have been getting a lot more views than they ever did on Youtube which makes me really happy! So yeah, if you do AMVs I recommend giving them a shot even if it's just to archive what you have uploaded on Youtube in case at any point someone puts a flag for a copyright strike on one of your videos or more - so that way it all still exists and people can see it. These are really well done mate.